Congratulations ! and way to stick with it. I had done the drift ( like yourself) on Friday. Lots of signs, one missed good strike, 1 jig bit off but ended the day with a bonito on bait and 2 small blackfin on the jig. Neglected to recheck the weather for Sunday, looks like it was nice and paid off, good going, Nice Wahoo ! Nice fish! Did you put it on a scale? Nah not this time. I need to invest in one. LOL, that 90lber has numbed your senses. 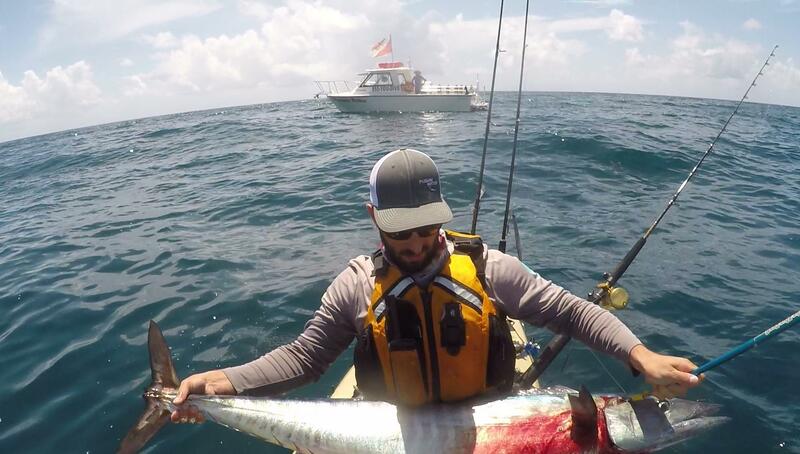 Many kayak anglers have been trying for years to catch a wahoo like that, and you hardly broke a smile until the dive boat inquired. Most marinas, fish markets and local tackle stores, will weigh it for you and having someone else put it on the scale gives witness and credibility. I own a scale, but prefer to do it that way. For a wahoo of that size, frequently a photo is taken, and the trophy adorns the bulletin board of the business for up to a year or more. I am not doubting your estimate, just a bit disappointed by the ambivalence regarding the catch. I definitely got spoiled with the 90 pounder lol. I was trying to stay calm, I know I make more mistakes when I get too excited so had to relax. My hands were definitely shaking after that though! My primary concern was preserving the quality of the meat and since I had to catch an Uber back to Boynton and then drive back, that would be an hour with the catch sitting in my bag. In order to make it fit I had to cut off the head and tail which would make it very difficult to weigh. I do kind of regret not weighing it but preserving the flesh I decided was my primary motive. Most people get surprised after they weigh their fish on a legit scale and realize that their 50lb fish is actually 20lb. I see it happen all of the time. Now I'm not saying your fish wasn't 90lbs or 40lbs, because both of the fish are large but please get yourself a decent scale. You'll get more credit for your catches. Definitely familiar with the magic scale concept so I tend to be conservative with my estimates. Nelli caught a 25 pounder the day before and he was with me and saw my fish which was quite a bit bigger. Also, my initial estimation of the 90 pounder I guessed was 60 pounds and that was weighed on a certified scale. If you wanna say this is 35 pounds, 30 pounds, 20 pounds, that's cool too, it's still a great fish. 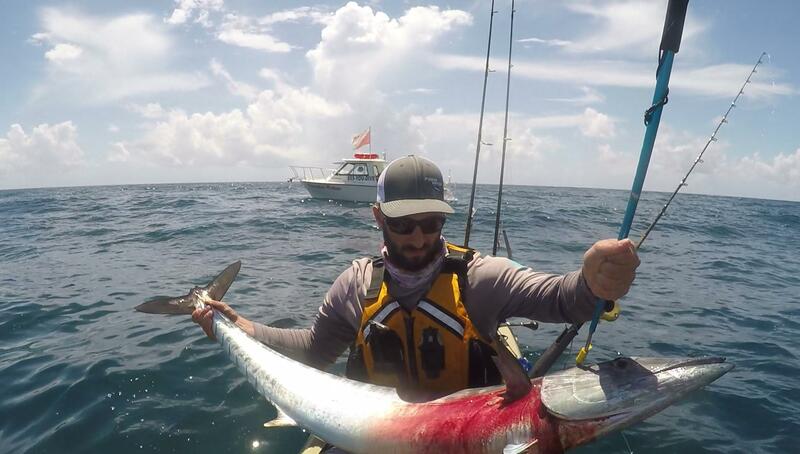 Nice wahoo and a nice size one. Glad your hands were shaking -- that's what makes fishing worthwhile ! Otherwise, most of us would be financially ahead visiting a fish market instead. Caught at the end of your trip should have been fine, just keep the bag and anything sticking out of your bag shaded. Preferably covered with something to keep it wet. I lay plastic bags or a wet T-shirt over any fish protruding my bag. On the drive back to your kayak, buy ice. Keep some jumbo trash bags in your car -- I store a jumbo fish bag in my car. When fighting a trophy avoid pulling the head out of the water. As a party boat deckhand, I saw many fish lost when the angler pulled the head out of the water instead of letting it lay flat with tension on the line. A horizontal fish is an easier target to gaff, and when the head is pulled out of the water, the fish sometimes break off due to the additional wt and/or the different angle of the line in relation to the fish's mouth causing a dislodge or cut off. Nice fish! Later in the day too. I have been taking the PA out spearfishing lately. It's certainly cooler when you are in the water all day vs baking in the sun, but this might motivate me to hit the wrecks on Saturday. Thanks for the post. Another "Bad Boy Wahoo!" Nice.